A question I often get from friends, is this: why become Anglican if there are other well-known expressions of the ancient Christian faith, such as Roman Catholicism or Eastern Orthodoxy? Because of this question being asked, the ancient heritage of Anglicanism needs to be explored. The shortest way I’ve found to answer that question is to direct my friends to a simple truth. Anglicanism is based on the early creeds and councils of the catholic church. Most importantly, it has roots in British and Celtic Christianity. According to Martin Thornton,, author English Spirituality , says Anglicanism is the “English school of Catholic spirituality.” Father Matthew Dallman has written a brilliant article on this topic. I encourage everyone to read it. In it, he summarizes key points from Thornton’s book. I will emphasize some of those points below. One of the highlights of Dallman’s article is the graphic below. As you can see, there is an important timeline, with important names to learn, in the English school. 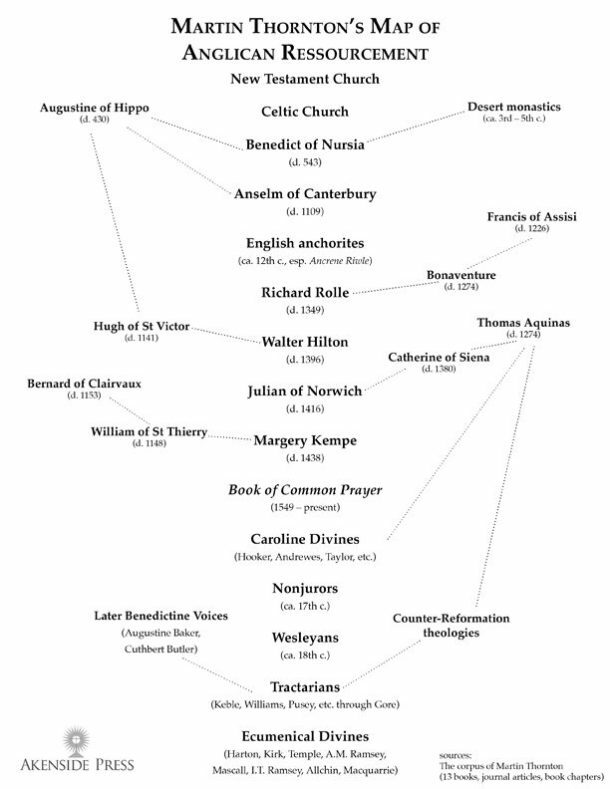 Hence, without learning about some of these key names, events, and theological developments, one simply cannot know “Anglicanism”. Thus, Anglicanism is not “Liturgical Protestantism” or “Watered-down Roman Catholicism.” Furthermore, it is a very rich tradition. The primary strand of the tradition is down the middle, with other influences coming in from the sides. Dallman concludes that in order to communicate the great benefits of the Anglican tradition to others, we must 1) actually KNOW what it is (and what it is not); 2) we must LIVE the tradition out in our lives – the Regula must be a lifestyle (see part 2 of this blog series).